The HTC Flyer price has shocked us as the tablet flew over to Europe for its debut, but the $700 Europeans have to pay for the Wi-Fi-only version of the 7-inch tablet have shrunk to a much more acceptable $499 stateside in Best Buy. The Wi-Fi-only version of the tablet is already listed for pre-order on the retailer’s website, but final availability is to ensue this Sunday, May 22nd. The catch is that the capacitive stylus for the tablet dubbed “Magic Pen” is notably absent from the Best Buy package and getting it separately would set you back $80, if we are to believe previous listing of the Magic Pen on the retailer's website. This would bring the tally to $580, which is still better than the hard-to-swallow price tag of nearly $700 for the same model with the stylus included. 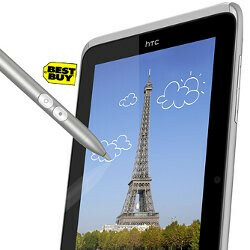 Best Buy is currently the exclusive retailer for the 7-incher. The HTC Flyer doesn’t stand out with a skinny profile as the trend is nowadays, but rather with functionality – along with the novel Magic Pen, the tablet comes with the HTC Sense UI ported to tablets and running atop Android 2.3 Gingerbread. Under the hood, a 1.5GHz Snapdragon processor powers the experience on a 7-inch screen with a resolution of 1024 x 600 pixels.